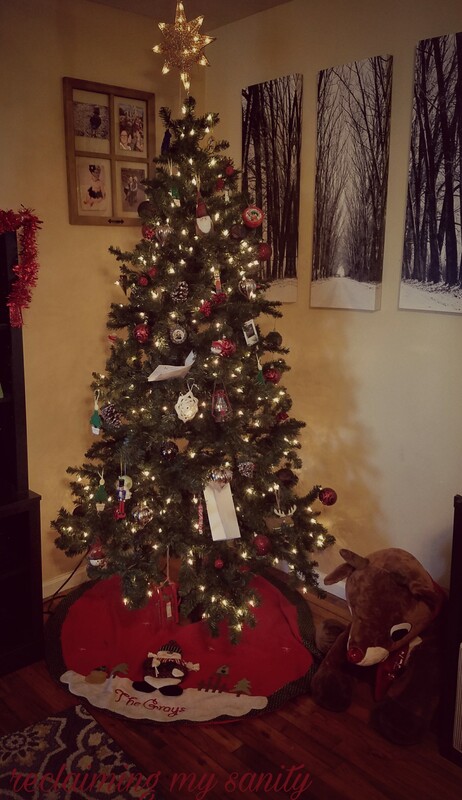 Every year we start off the Christmas season by decorating the house. We decorate the inside as well as the outside. This year wasn’t any different. We had our decorations up by Thanksgiving. Usually, before the Christmas season, I make an advent calendar with activities for each day leading up to Christmas. 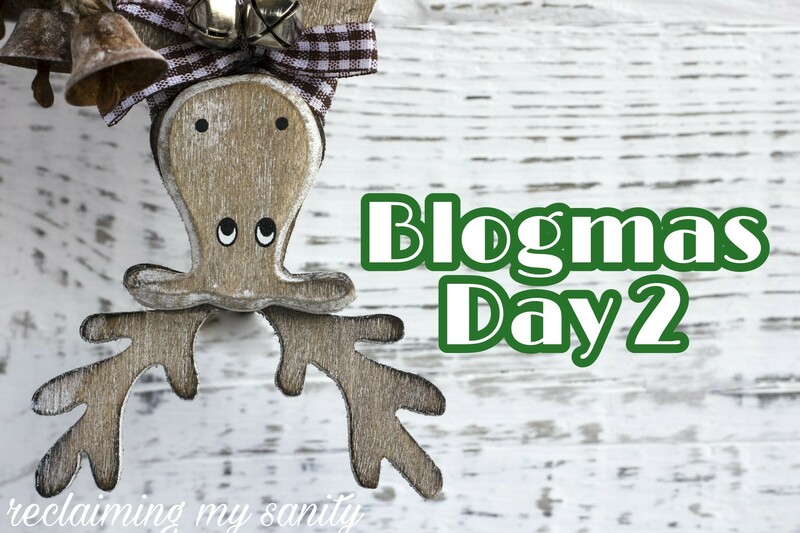 This year, I didn’t make a physical advent, but mentally I know the usual activities. One of the first things we do, is write a letter to Santa. 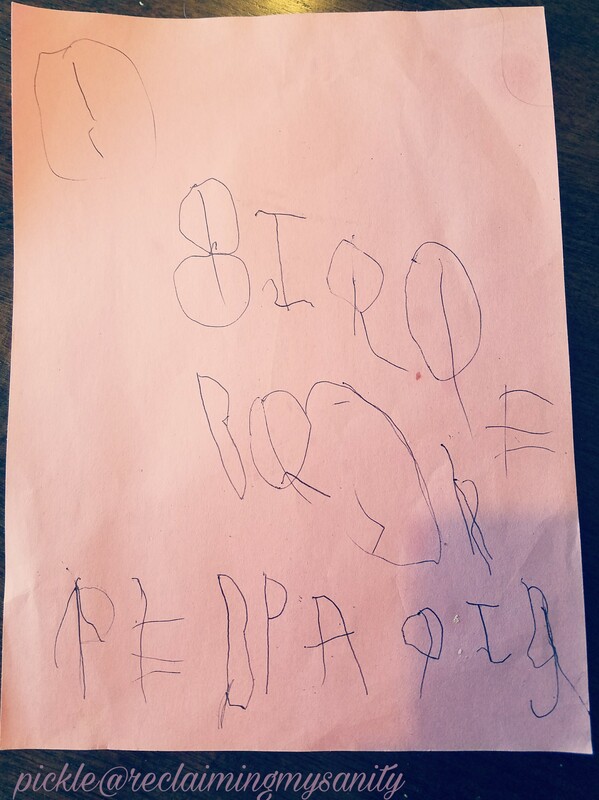 Now that Pickle is in preschool he is learning how to write letters of the alphabet. 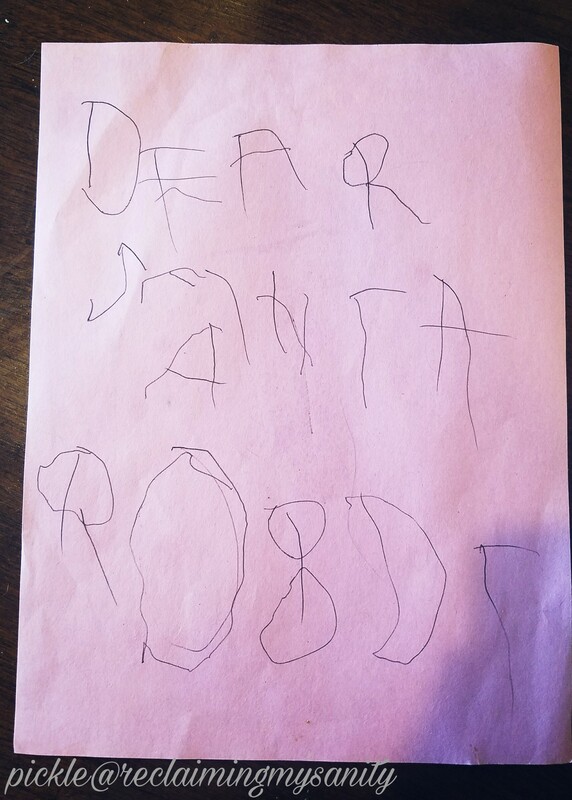 When I asked him about writing a letter to Santa, he told me HE was going to write it. He would ask me how to spell what he was trying to say and he wrote it out. I got a little emotional at the fact that he was actually able to write most of it legibly. Here is his letter. We wound up writing 2 more letters, just for good measure. He cracks me up! In his long letter, he stated about 3/4 of the page worth of the things he wanted. One sentence for what he actually needed. Then finished it with a paragraph about what his baby sister would like for Christmas. He thinks she needs everything in Princess form. He’s so cute and funny. Once we were done, without provoking, he said “we need to put these in the tree so it can be mailed to Santa.” I helped him fold them and in the tree they went. I have no doubt Santa will find them. Every year we have let Pickle pick out 1 special ornament and I write his name and the year on it. I figure, when he is older, he will enjoy looking back at what he picked out. Poppy gets to join in on the fun this year. Last year we had her ultrasound picture in an ornament frame. We have a baby’s first Christmas ornament for her picture to go into this year (Pickle has one from his first also). Alas, we went to Target. Pickle couldn’t make up his mind if he wanted Lightening McQueen, a cheeseburger, or superman. After much deliberation he went with Superman. Poppy sat in the cart saying “wow” at everything she saw. She started pointing and I grabbed what it looked like she was pointing at, Cruise from Cars 3. She didn’t want to let it go. She started pointing at another one, but I wasn’t sure which she was looking at. I grabbed the Belle ornament and she took it from me. I had to get both of them from her and held one in each hand. She looked back and forth for a minute, but then grabbed the car ornament. So, she got that one. I really love Christmas, one reason being it has many fun traditions that we enjoy. Your ornament idea is a wonderful one. Have you heard HOW some Korean families put toys to know their child’s future on the 1st birthday? if they pick a stethoscope, they will be dr, a pencil, a writer etc. I wonder if Poppy will drive race cars like Danica Patrick. I have not heard of that! Very interesting! I always say racing is in their blood since Chris’ family is a lover of racing. His dad use to race dirt track and Chris and his brother raced in junior dragsters.